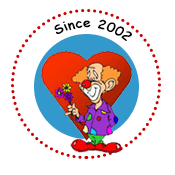 (Poulsbo, Washington) – Caring Clowns International, a 501c (3) charitable organization, today received a Silver rating from GuideStar, an online organization which gathers and disseminates information about every IRS-registered nonprofit organization. The GuideStar rating provides information about Caring Clowns International’s mission, legitimacy, impact, reputation, finances, programs, transparency, governance, and so much more. GuideStar is the world’s largest source of information on nonprofit organizations. “We are delighted to have achieved a Silver rating,” said Jed “Duffy” Selter, President of the Board and Acting Executive Director of Caring Clowns International. “As an all-volunteer nonprofit, we keep our overhead costs to about 10% whereas most U.S. nonprofits average 30-35% overhead cost,” he said. In addition to providing a rating to Caring Clowns International, the other benefit of the Silver rating is that it allows individuals who visit the GuideStar website to automatically make a donation to Caring Clowns International whose mission is to help fund humanitarian projects through other well-established nonprofit organizations and clown to help awaken the human spirit. The next highest level of rating on GuideStar is a Gold Rating. The Board of Directors of Caring Clowns International is working to provide additional documentation to receive a Gold rating level.